Here in Philadelphia, we’re having what one might call a “real winter.” Snowstorms, subzero temps, dangerous road conditions, loss of power — you name it, we’ve had it. 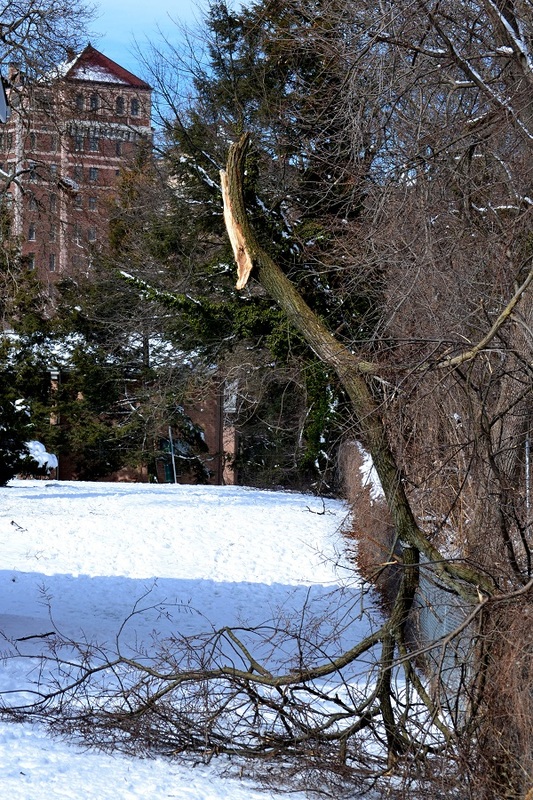 Last week’s ice storm closed roadways, toppled trees, and left thousands without electricity. Four days later, many residents are still without power. 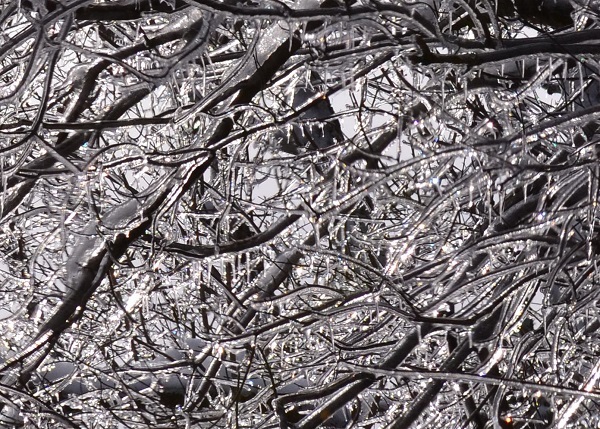 Ice storms are deceptive in that they start out like any other rain. “The rain in Spain falls gently on the plains.” It sounds almost soothing, does it not? 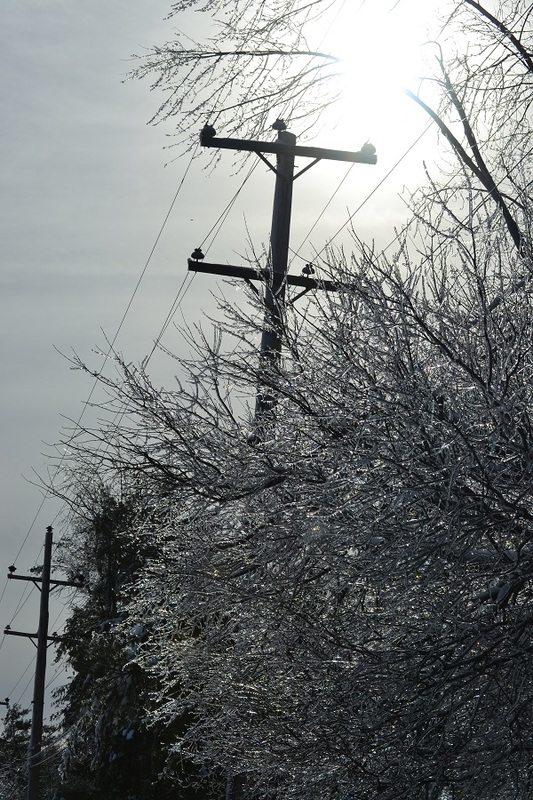 But that rain quickly transforms into ice, leaving a slick glaze in the wake of anything it touches: flora, fauna, and (most precariously) electrical wires. 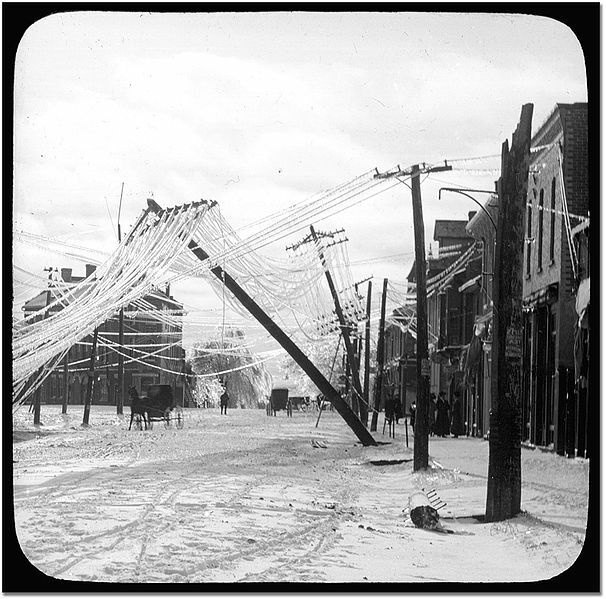 To your right is an impressive (and sort of hysterical, although it probably wasn’t for residents at the time) century-old photo courtesy of Wikimedia Commons, which illustrates just how much damage an ice storm can do. Hi Ilona! “Icelandia,” eh? I like that. Sounds like quite an adventure for both you and the band! Hope things warm up soon for both of us. Love ya! 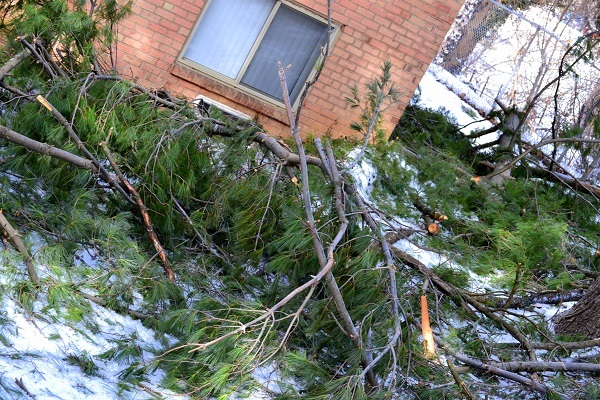 I know how devastating and painstaking the clean up can be for ice storms. Lucky you still have electricity/wi-fi! Still feel for you being socked in. 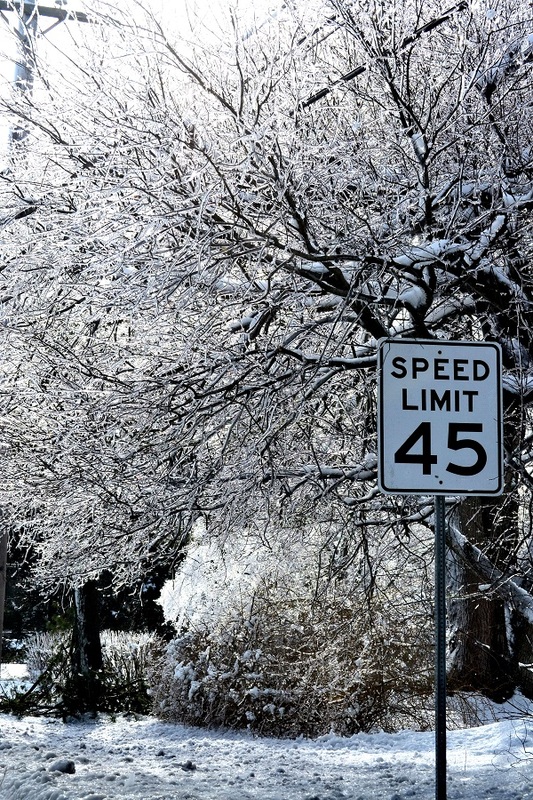 This winter will go down as record-setting for an extremely, cold, snowy, and stormy winter for sure. Minnesota has had extreme cold temperatures with a record-setting string of below 0 days. Your depiction of the Philladephpia ice-storm through your photos protrays the devastating effects of extreme winter weather for 2014. Thanks for posting these pictures Gina! Hi Mom! Yes, this winter has been a doozy for much of the country, it seems. Warm wishes to you, and thanks for stopping by and leaving a comment! 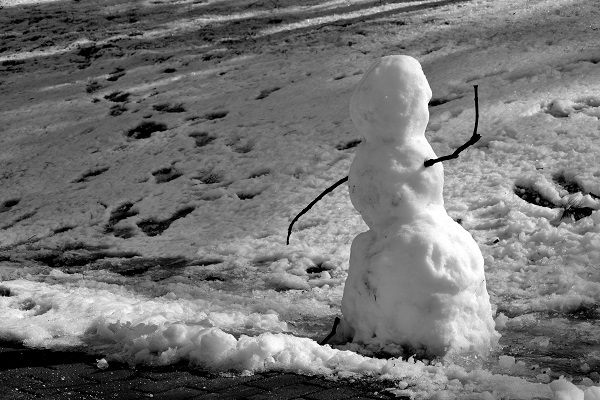 Love the snowman picture. I think you might even be beating us this year – lol. 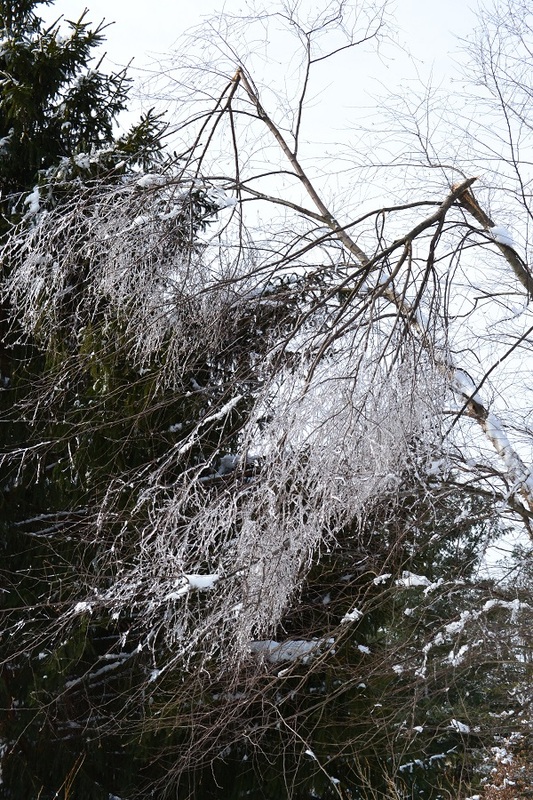 While we have had wayyyyyyy to much cold sub-zero temps, the ice storms have been kept to a minimum. Looks like Michigan winters in PA this year! Isn’t the snowman precioius? Some neighbor girls brought him to life, and even gave him bottlecaps for eyes. Unfortunately, he lost those during the ice storm. Last I checked, he’d also lost his head. Poor guy. Yay for no ice storms in MN! That’s the last thing you all need. GINA!! Come back to the social media world. Too much I want to tell you and you’ve been gone too long. We met a lovely couple out in Arizona last week – the woman was from Minneapolis and said that she thought the winters we’ve been having in Philly/east coast are starting to rival MN! Hehee. Hope you’re doing well in the balmy 40s of today! Stop by and say hello on my blog when you have time. Thanks for your sweet comment, Patricia. I’ve definitely missed it at times, but I’ve also come to appreciate my virtual time away. Going to check out your blog now; thanks for the heads up. And HAPPY FRIDAY!!! Indeed, February has been a peaceful (and somewhat hermetic) month. I’ve enjoyed it thoroughly, snow and all. Patricia, that’s awesome to learn you attended the InLiquid show and I’m honored that Brian was able to pick out my work from the many fine pieces on display. 🙂 I hope to see one of your pieces up close and personal in the near future, as well.